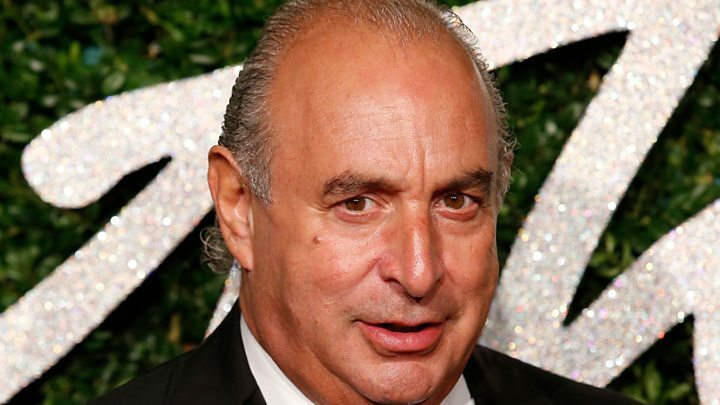 A woman has accused Sir Philip Green of harassment by subjecting her to a barrage of verbal abuse during her time working for his Arcadia Group.And she told the BBC if she responded her replies were "considered worthless" and she felt there was nowhere to go because Sir Philip owned the firm.Other ex-employees called him a bully, saying he threw stuff at staff if he thought they were underperforming.Arcadia said it thoroughly investigates any accusations and grievances raised.In her interview with the BBC, the former senior staff member at Arcadia, who did not want to be named, said: "It was the f-word all the time, just tripping out of him, rolling off his tongue. I found it really aggressive." "He verbally harassed people and it was a constant verbal barrage - it was an attack," she said. "But when it becomes constant and you're not given the right to reply, and when you do reply, your reply is considered worthless, there's nowhere for you to go. And he owns the company that you're working for." Last month, Sir Philip was named as the man behind a court injunction which prevented the Daily Telegraph from publishing allegations of sexual and racial harassment set out in complaints by other employees.He subsequently said that he wholly and categorically denied allegations that he has been guilty of unlawful sexual or racist behaviour. He later told the Mail on Sunday there had only "been some banter" which had "never been offensive".But the former employee, to whom the BBC spoke, said that, in her experience, it was "absolutely not banter". "This was aggressive, it was threatening, it was constant and it just brought you down constantly," she said. Other former employees, who also did not want to be identified, told the BBC that while Sir Philip could be friendly and generous, he was also a bully.Several said he was known to throw things at staff if sales were not doing as well as expected. One woman said she had to complain to him about his behaviour after she saw him throw footwear at another member of staff. "He picked up a pair of boots, shouting and swearing at her and threw them at her. Luckily she ducked," she said. "This is in front of the whole team. "He said 'what do you mean I can't do that.'" Swearing, he said he was paying her wages so 'I can treat her how I want. '"She also said Sir Philip used a Yiddish word often seen as a racial slur when describing a black man. The former employee said another colleague had been discovered trying to hide from him in a cupboard to avoid having to meet him. "Everybody was on edge when they found out they'd have to be meeting him," said another former employee. "He'd feel comfortable insulting people in large groups as well. He felt he owned everybody in the business. "But another former senior staff member was supportive, saying that Sir Philip was just a passionate businessman who wanted things to be done right.A spokesperson for Arcadia said it has a clear grievance policy in place across all its businesses for any colleagues wishing to raise concerns. "We take accusations and grievances very seriously and in the event that one is raised with us, it is thoroughly investigated," they added.